The Weiss Agency represents on-air talent, program producers and management in the broadcast industry. 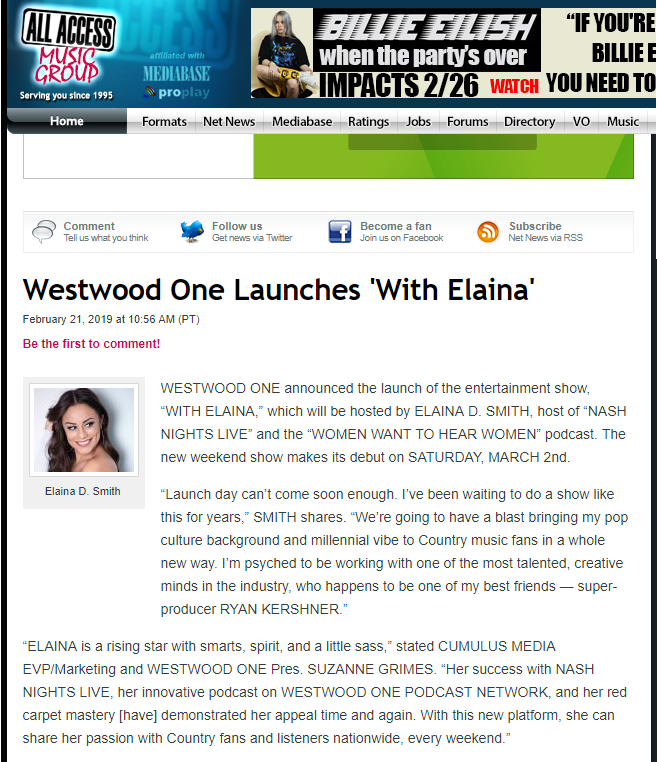 Westwood One announced the launch of the entertainment show, “With Elaina,” which will be hosted by Elaina D. Smith, host of “Nash Nights Live” and the “Women Want To Hear Women” podcast. The new weekend show makes its debut on Saturday, March 2nd. Councilmember Bob Blumenfield celebrated and honored local media legend Jillian Barberie by declaring February 19, ‘Jillian Barberie Breast Cancer Awareness Day’ in the City of Los Angeles. Marking a return to New York City, NASH FM 94.7/New York will launch its new Morning show, “KELLY FORD IN THE MORNING,” on Monday, February 4th! Syndicated morning show hosts Jack Armstrong and Joe Getty are this week’s guests on the award-winning PodcastOne series “The Michael Harrison Interview.” Harrison caught up with Jack and Joe last week to discuss their fabulous radio partnership… where it’s been, where it’s at, and where it hopes to be going – set against the backdrop of turbulent political times and extraordinary social/technological change. When we were considering working with Eric we asked a prominent client of his in talk radio how working with Eric had been for him… He said, “he got us more money than I thought was possible.” That happened to us, too, thanks to Eric. 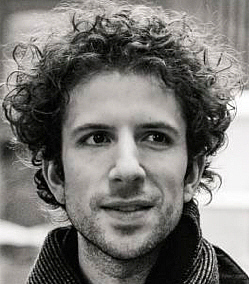 In tribute I will name my next kid ERIC WEISS. Even if it’s a girl. The day we decided to work with Eric Weiss was the brightest day of our careers. A promising career became a successful career. Hopes turned into strategies, aggressively and intelligently pursued. We have never, for one minute, wished for more than Eric could give. He’s a rock star. We hope Eric Weiss is our agent on the day we retire. Some day we may even invite him to our private pleasure island where the laws of God and man mean nothing…but not yet. Heather Cohen is far beyond just an agent. Yes, she does all the things agents do-and does them incredibly well-however, Heather is also a brilliant career coach and a strategy professional. On top of all that, she is an incredible person with a huge heart. She is immediate with response and fully committed to super serving her clients. The fact that I’m doing exactly what I want to be doing in radio today is directly related to Heather’s skill set and dedication to my career. I couldn’t imagine having a better teammate. The co-creator and host of American Top 40, and host of American Top 20 and American Top 10 on the Premiere Radio Networks, Hall of Fame broadcaster and undisputed King of the Countdowns. Host of Red Eye Radio. As published in LA RADIO.COM February 2010. Heather Cohen is everything you could possibly want in an agent. She is a fierce advocate and a loyal friend. Heather genuinely cares about your vision and your dreams. 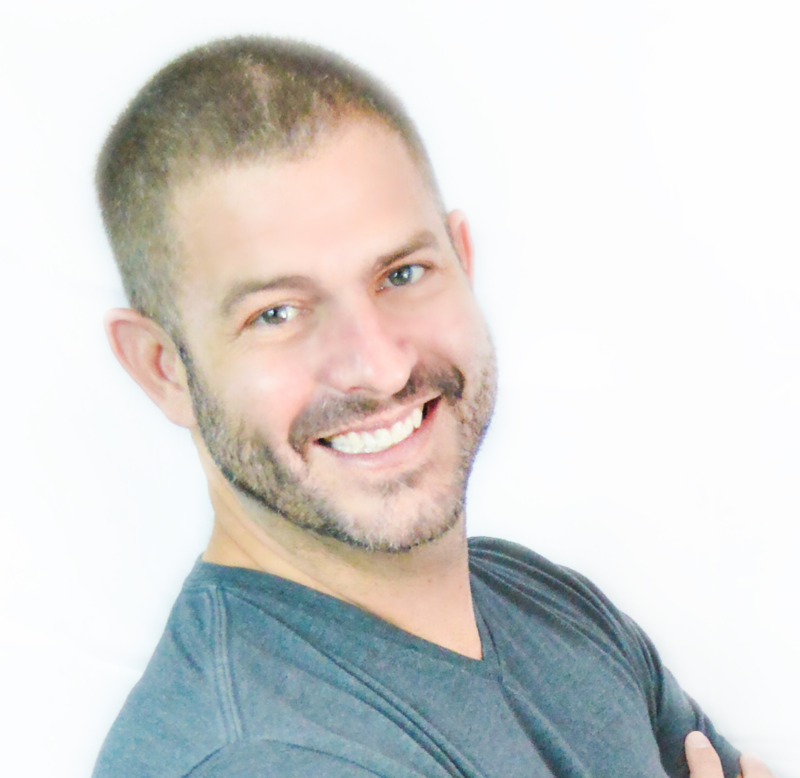 The Weiss Agency has the best movers and shakers in the industry with all the right connections to bring your aspirations to fruition. With over 20 years in radio, I can confidently say that Heather “friggin” Cohen is the “Holy Grail” of agents, and I wish I had been lead to the Weiss Agency before my unfortunate experiences with other agencies. Today, I am achieving my dreams all because of Heather and the Weiss Agency. They have become some of my closest confidants. Thank you, Heather, Eric, and everyone at the Weiss Agency for believing in me and standing by my side always. Platinum recording artist and afternoon drive host on the daily, nationally syndicated Smooth Jazz Radio Network and host of the nationally syndicated weekend Dave Koz Radio Show.